#613 bundles with cloure will give you full blonde hair outlook. This product contains 3 #613 bundles with one lace closure. 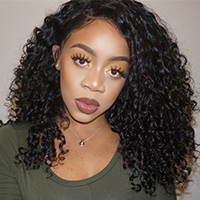 New Star collects raw human hair from Brazil to make these #613 hair bundles, bundles wefts are sealed tightly to guarantee no shedding, each bundle is measured to be in true length. With one lace closure to match these #613 bundles, your hair will look fuller, thicker and more natural. Run your fingers through the hair wefts, you will feel super soft, silky and no tangle. You must do a regular deep conditioning on these #613 hair to ensure a long service life.